What is the Best Way to Protect Ugg Boots From Water Damage? Ugg boots, also called Uggs, are sheepskin boots that became popular among the general public in the early 2000s. The boots are lined with wool and have a tanned sheepskin surface. Ugg boots were worn by swimmers and surfers for keeping their feet warm when not in the water, especially in cold areas. This may be because Ugg boots are meant to be worn without socks, so the athletes could just slip their feet into the boots after being in the water. Ugg boots can be worn in the rain, but they should be protected against water damage. The Ugg boots company sells an Ugg brand Stain and Water Repellent that is designed to be used on your Ugg boots when you first purchase them. 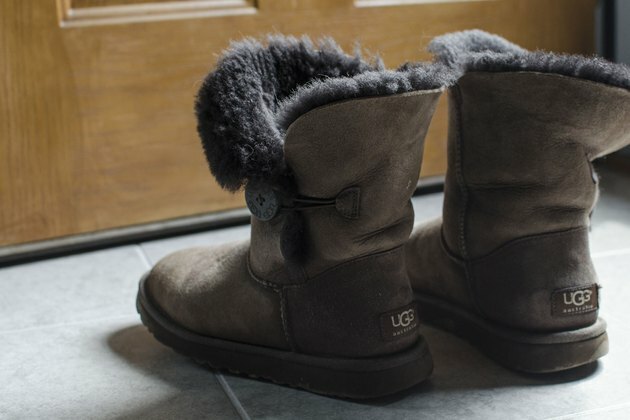 The Ugg company suggests that you wash and condition your boots with their Sheepskin Conditioner and Cleaner before using the Stain and Water Repellent, both of which can be purchased at the Ugg website. Dab the boots with a clean towel soaked in cold water. Apply a dime-sized amount of Conditioner and Cleaner to another corner of the towel and gently work the lather into the shoes. Wipe the shoes with the clean-water side of the towel to rinse. Do not drench the shoes or dip them in water and never use hot water on your Uggs. Do not place Uggs in the clothes washer or dryer or they will warp. Allow the damp boots to dry completely. Put them on a dry towel in a cool, dry place for best results. The boots may take 24 hours to dry completely. After the boots are completely dry, spray them thoroughly with Ugg Brand Stain and Water Repellent. This will form a coating that will prevent water, dirt and stains from seeping in or being absorbed by the boots. Spray with this repellent every few months to keep a fresh coating on your boots. If your boots get stained, clean and condition your boots by dipping a towel in cold water, adding a small amount of Ugg Brand Conditioner and Cleaner, and dabbing the stained area. Rinse the towel in cold water and dab the stained area again with the clean wet towel. Allow the boots to dry in a cool, dry place for several hours, then spray the previously stained area with Ugg Brand Stain and Water Repellent. Can You Clean the Ugg Cardy?